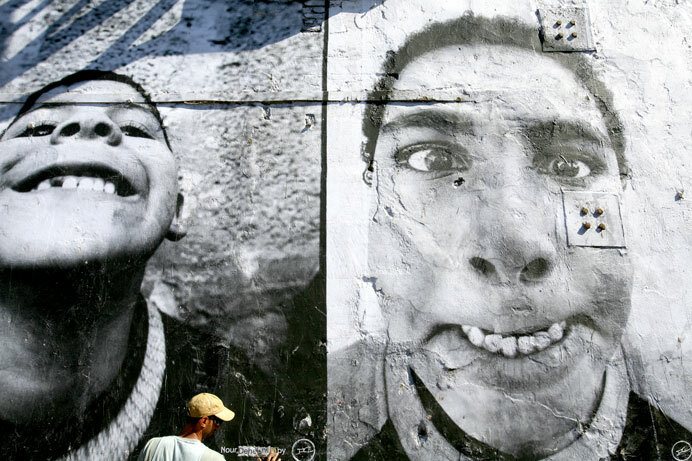 BLDGBLOG‘s Geoff Manaugh raises challenging questions about Franco-Tunisian “undercover photographer” and graffiti/poster artist JR‘s exhibition of photos called The Hills Have Eyes. JR’s story is that he found a camera on a Paris subway station platform in the year 2000 and has since gone around photographing suburban ghetto rioters in Paris, impoverished and abused women in Africa, break-dancers, graffiti artists, snowboarders, and other outsiders, and pasting photo blow-ups of his work on city walls and in war zones around the world. He has taken close-ups of Israeli and Palestinian faces, then pasted these as huge posters on the Wall separating Israel from the West Bank. 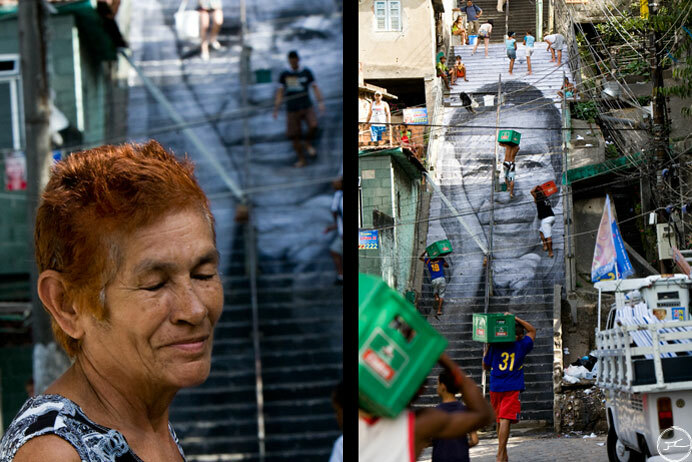 “The Hills Have Eyes” plasters the walls of favelas in Rio de Janeiro with the eyes of their dwellers. And, I would add, isn’t Manaugh’s (and my) raising these questions unfair in relation to JR unless they are raised all the more in relation to other artists whose race or social class origins are more typical of the art world? Some of the comments on Manaugh’s blog suggest as much, i.e., that just because someone is good at what they do doesn’t mean they shouldn’t make a good living at it. But there’s also something about the message here that undercuts the art world’s individualism and reaches to, and preaches for, a global level of common humanity. One of the growing artistic trends of the last two decades is a globalism that ranges from films like Ron Fricke’s Baraka and Alejandro Iñárritu’s Babel to Matt Harding and Melissa Nixon’s viral YouTube video Dancing to the marketing campaigns of companies like Benetton (with its “United Colors” and Colors Magazine) and the imagery of Buddhist monks drinking Pepsi or chanting the benefits of an Apple computer. I want to be able to include the work of indigenous and Third World artists in that list, but for the most part those who deliver this globalist message are corporate globalizers, First World liberals, or upwardly-mobile ghetto artists like JR speaking to a global audience; actual grassroots artists generally speak out of their own experience and to their more immediate context. What I’d like to see is more of a filling in of the gaps between these poles, a breaking down of the “geometry of power” (in Doreen Massey’s words) that holds the pyramid in place whereby its base serves as fodder for the global-entrepreneurial creative class which in turn serves capital. Is JR’s work an indication of this happening? What I find most interesting, though, is the level at which this emerging representational globalism shapes and affects the language of global communication at a basic bodily and affective level. In spite its superficiality, I find the silly-but-somehow-profound “Dancing” appealing. Aside from the obvious fun these people are having, and aside from the just-a-little-less-obvious critique that this is nothing but wealthy camera-equipped white folks flying around the globe to have fun with the natives, the video is also about a certain global contagion of bodies in motion (even if it’s initially triggered by Matt’s silly, mechanical jitterbug hop), and about the groping towards a certain, if whitewashed or pastel-colored, soundtrack of a global humanity that’s part Hollywood, part Bollywood, part Live Earth, and part (potentially) everything else. The viral nature of videos like this — Harding’s dancing has ostensibly been viewed over 17 million times — also makes it important for us to think about the effects they have. (The likable Harding talks, sometimes hilariously, about the “hoaxness” of the video and the “army of animatronic puppets” they (didn’t) build in his January 6 and January 9 blog entries.) There’s a lot of Ph.D. thesis potential in ethnographically documenting the effects of some of these interventions — Baraka, Harding’s dancing, JR’s “The Hills Have Eyes” — in the places where they are produced and where their effects linger. “Finally, though, there are the eyes: in these images, you are being looked at in return. But who is meant to identify with this? Are these the eyes of the favela dwellers looking out upon a city they cannot access, as if to shame those more privileged residents? Or, as the poor wander home at night up steep streets, are these the eyes of the world looking down at them in judgmental scrutiny? “Again, though, there is a third class of people involved here. 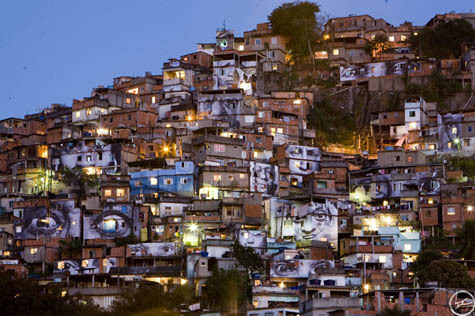 Perhaps these eyes aren’t looking at the favela at all, and they aren’t looking down at the city below. The question we’re left with is: whose eyes are returning our gaze from the walls of that open-canvas world? Are they ours, or theirs, or something emerging in between, something in common, moving, and to a rhythm we can learn to move to?